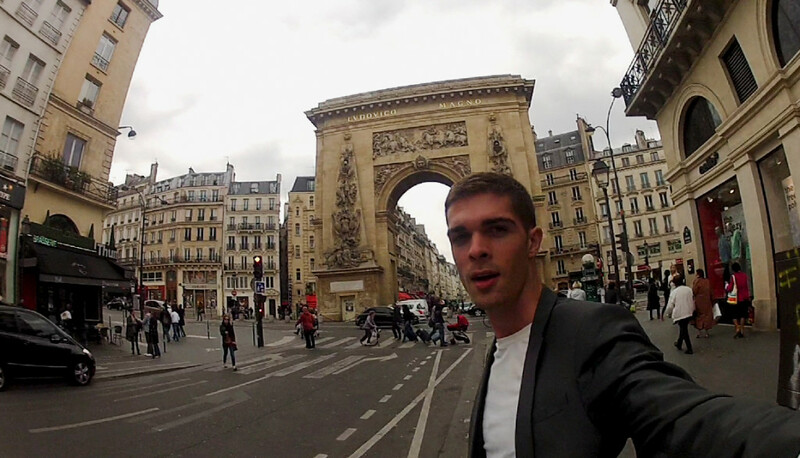 In May 2013, after backpacking through Southeast Asia for three months with a friend, I travelled alone to Paris, France. It was my first time in Europe and I was terrified. I spent my first few days in town searching for appropriate clothes because, as it turns out, it is the ultimate faux pas if you arrive in Paris wearing the sandals and tank tops you wore in Bali for the last few months, as communicated to me by the face of every other local that I walked by. One of the only photos of me in Paris. Post-clothes shopping. At this point in my life, I was more emotionally shut off to women than I’d ever been. I’d had my heart broken too deeply and too many times and I was resistant to anything remotely resembling a romantic relationship. Maybe it was the seemingly unending supply of red wine that kept finding it’s way into my stomach or the loneliness of travelling solo but, late one night, something compelled me to reactivate my OKCupid account for the first time in years. Within minutes of logging on, a gorgeous, blonde Swedish woman named Linnea caught my attention. I sent her a single word, and within a few hours of that first message we agreed to meet up in person for a meal. The conversation (and the red wine) flowed, we connected on multiple topics, and it just felt easy. We were walking along the river when it started to rain. Not drizzle rain, but pouring rain. We talked about finding shelter somewhere but we decided that it would be more romantic if we simply kept walking in it. We ended up walking in the rain (sometimes drizzling, sometimes pouring) for close to four hours that day. My one new outfit that I had deemed Paris worthy (white shirt, grey blazer – pictured above) had soaked completely through from the compounding effects of the rain. I had been enjoying our conversation so thoroughly that I hadn’t had the mental bandwidth to realize that my hands were starting to go numb from the cold. I realized how cold I was when she took my hand in hers. In one of the most profound wordless moments of both of our lives, we each had something shift inside of us. Before we had crossed paths we had each been closed off to love for different reasons, and before either of us had the time to think of any words or thoughts, a spark of electricity ran through us. Instinctively she cupped my frozen hand between her inexplicably warm palms. And words can’t do justice to how much that moment affected me, in the moment, and even today, years onwards. The warmth of her hands, and the intimacy of the gesture, immediately seeped into my bones. Where my bones, veins, and heart were icy, she sent her love. The moment her second hand reached out to envelope mine, I started tearing up. I had spent so many years running away from the warmth, touch, and affection of women that this gesture got me at my core. My thoughts went from “This isn’t safe, you should leave”, to “Is this what I’ve been running from for so long?” in a matter of seconds. Our date was like the rain we were in… it was liberating and unpredictable and, despite my clothes being completely soaked through, I’d never felt more free. I stayed in Paris for nearly a month, and I ended up seeing her at least every other day that I was there. I just moved into my first ever year lease and, after a couple of months of living here, I realized that I should probably decorate a bit to make my apartment feel more like a home. I decided to print off four enlarged photos that represent each of my core personal values: openness, creativity, tenderness, and connection. It wasn’t until the photos were up on my wall that the memory of the depth of the tenderness of that moment in the rain came rushing back to me. I deeply believe that people come into our lives exactly when we need them to, whether we know it or not. So thank you Linnea. For holding my hands, and my heart, with such grace and tenderness. I haven’t forgotten a single detail of that day, and the warmth of that simple gesture has affected me deeply every day since. Ps. The photo at the top of this article (and the one that is now hanging on my wall) was taken by me, in Linnea’s shoebox apartment in Paris, as our clothes hung up to dry around us. She humoured me in allowing me to take 5-10 of these selfies until I had something I could use for my (at the time very new) blog. Something inside of me knew that I’d want to write about our relationship more down the line, and she was gracious and patient enough to let me take as many shots as I needed. Pps. If you’d like help opening yourself up to love, I get it… and I’ve been there. Feel free to reach out and chat whenever you feel like you’re ready for something big, and breathtaking, and beautiful. You deserve a big love that cracks your heart wide open, shared with someone who cherishes you.